Stand out from the crowd and elevate the experience! usic concerts and festivals are events of high energy, excitement and constant buzz. Make the best of it all and give your attendees an experience they will never forget by presenting them with a platform to connect with other event goers, event guests and even the performers! By displaying Wallery all throughout the venue you encourage social sharing and fun conversations between the fans from the moment they set foot into your venue to long after they’ve already gone home. 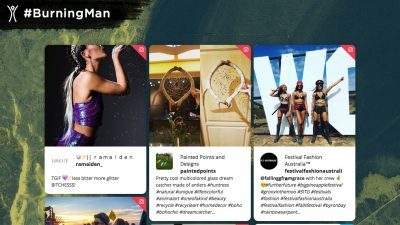 Wallery is a powerful social media tool that lets your event audience feel more connected with their favorite artists and with each other. Not only that, but you can also use it to run contests or promote your other upcoming events. Embed our Wallery hub onto your website and display all relevant social media posts from Twitter and Instagram in the days leading up to your event, and watch it become a place where the fans can later return to relive their fun memories from the event. Wallery is just as fun behind the scenes as it is around the venue. You can give your performers insight into the excitement of their fans before the show and inspire them for another great performance by placing Wallery in the green room and the VIP section backstage. From there, the performers can engage with the audience before the show and help you pump up the fans at the event and at home by engaging with them on social media. 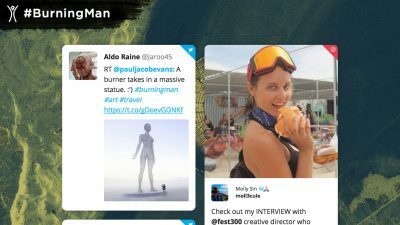 Our Two Columns layout, displaying the #BurningMan hashtag. 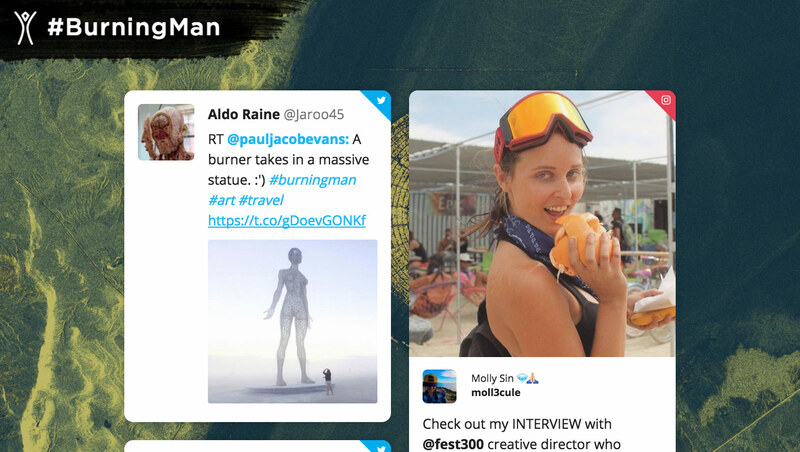 Our Tiles layout, displaying the #BurningMan hashtag. 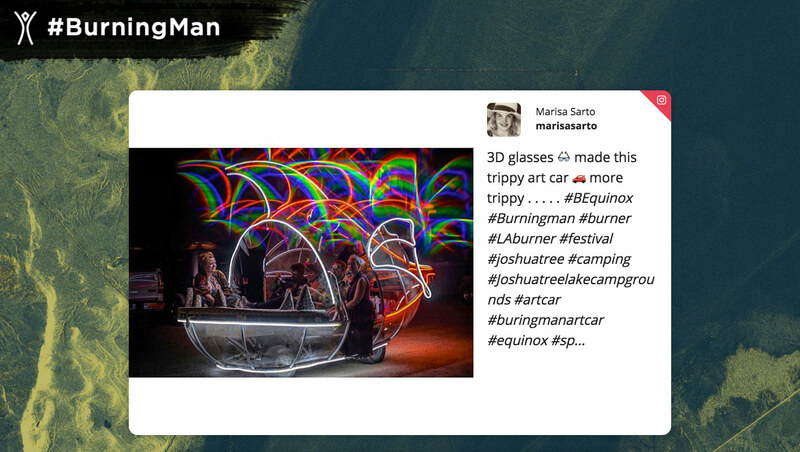 Our One Column layout, displaying the #BurningMan hashtag. Think big. No, bigger! Wallery will look flawless embedded on your website, and thanks to our responsive design – she will look just as great on big screens. DOOH screens? Check. Jumbotrons? Check! Projected onto a side of a building? Now you’re thinking big. And we like it. Check! If you choose to, you can use parts of the screen to display your owned content, such as a call to action if you are using Wallery as a social media hub on your website, or to promote the lineup of your concert or a festival on your social media wall during your event. Your events are unique and you want your social media wall to reflect that. Design Wallery to be as edgy and fresh or as classy and uniform as you want. Our user-friendly Wallery Designer interface will delight you and keep you coming back. Use your brand colors and your logo, change fonts and more! Organizing big music festivals and concerts is often a joined effort. With Wallery, you can display logos and products of your partners and sponsors alongside the social media content from your guests and fans. How about that for a non-disruptive marketing strategy? Content discovery and moderation has never been so easy! Choose between assigning your team members as moderators or use our auto-moderation system equipped with profanity filters in English (more languages coming soon). You can also create your custom profanity filters.